Your Resume has been selected by Company HRD. 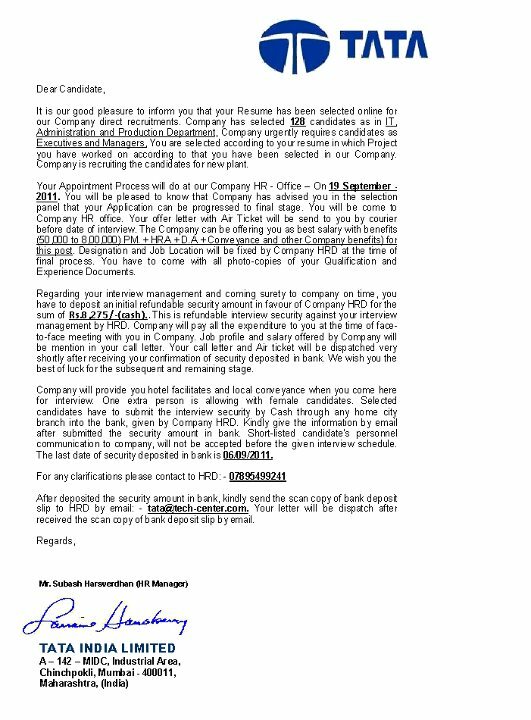 I have attached your Appointment Process letter with this email. Kindly see the attched file for more details. over there it states i would be provided airticket and call letter through courier but prior to that I should deposit Rs.8250 in the account name of Any employee a/c no: 730064335643 as a security money which will be refundable. It has been noted that several of students are receiving such fraudulent mails. Please note : The mail Id and Phone numbers given belong to the Criminals and not of Tata Group The same Scam Mail/SMS was being sent earlier in the name of Hitachi, Videocon, Wipro, Sansui, Godrej, Sony, Bajaj, HCL, IFB etc. 1) Please note that the mail is being sent by id which is not company, a normal company mail would always have companies name in the end, example info@tcs.com, in case of these fraud ids, the name of company is in the beginning e.g. tata@interviewmail.com Many innocent people simply send money though the money is to be paid in the name of some individual and not in company name. 2) No Organization would want money in advance for your travel booking, they wouldusually ask you to buy your tickets for the interview and then reimburse the money after you fill up travel reimbursement forms and submit a zerox of the travel ticket in their Administration department. 3) Most important of all whenever there is a mail from any organization giving you offer letter, please make sure you first search in Google about the background of the organization,their management and also talk to someone who works there. 4) Last but not the least in case you have received any such mail and want to confirm then forward the mail to me and discuss it with me, I always check my mail twice a day, I will revert back to you. But in any case the bottom line is Please do not pay any money in advance.